Portrait painting in oil may appear a challenging mission. This is why I have written a book on how to paint portraits for artists looking for a step by step guidebook on art. Inside you will find 10 demonstrations on portraiture plus a section on how to get started in portrait painting. Now available as large edition, Portrait Painting in Oil: 10 Step by Step Guides from Old Masters is bursting with guidance and tips on effective portrait painting. To serve portraitists who wish to explore different skin types, I have selected old master oil paintings that feature a diversity of subjects: dark skin, pale skin, blonde hair, dark hair, facial hair, children and older subjects. An extra demo on a modern-day portrait has been included. 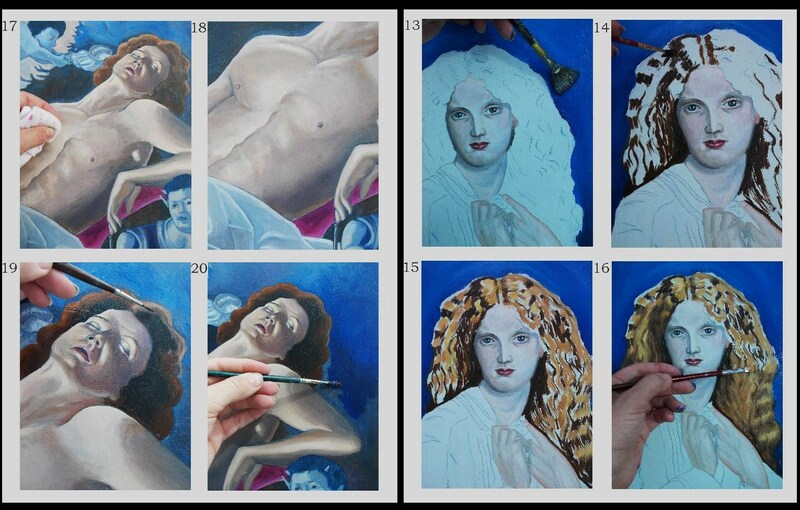 The image below shows a preview of how the images in progress look. Notice how they are clearly numbered. In depth corresponding instructions accompany each image within the book. I have also selected the paintings with a particular art technique in mind. The use of the palette knife might complement a subject under dramatic lighting; the employment of fine washes for a subject possessing delicate skin tones. Other techniques have been explored such as ‘scumbling’ (broken, vigorous brushwork), glazing, impasto and alla prima. Having practiced portrait painting for many years, I have learned a lot about painting faces. This includes how shadows can create visual distortions regarding how features relate to one another, and how convincing skin tones can be achieved with just a few oil colours. Really, skin tones are all about how one colour relates to another rather than having to mix lots of earth colours to achieve a specific skin colour. See slide show below to get an idea of how the demos are set out. 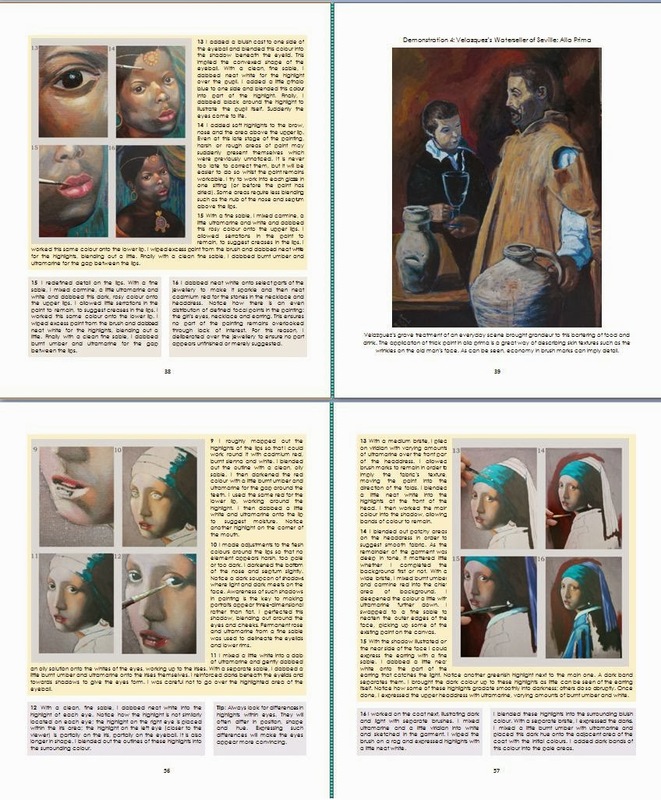 This essential guide for portrait painting includes introductory chapters on all the art materials you will need to complete the paintings, including help and advice on what to buy. The screenshot on the right gives an idea of how the interior of this new large edition looks. As can be seen, just several oil colours are needed to produce just about every skin colour you will need. I used just six brush-types, a palette knife and self-prepared art surfaces, which is cheap and easy to do. Instructions on self-preparation are included. You don’t need a studio, large easel or a mahl stick to produce portraiture in oils. This book shows how space and hassle can be dispensed with when painting portraits. Learn about how preparation is vital for a successful portrait painting, including the underglaze. This comprises a thin wash of diluted acrylic paint that not only kills the off-putting whiteness of the art surface, but injects mood into the painting. ‘Negative shapes’ of the portrait whilst in progress is also easier to decipher. Learn the various methods of underdrawing and which colours to apply first on the painting. I have included chapters outlining remedial techniques for portraiture. If something goes wrong, how it can be put right, such as ‘tonking’, blotting and wiping. An extra chapter offers troubleshooting advice for common problems to assist the developing portraitist. Jacques-Louis David: Oath of the Horati; Botticelli: Venus and Mars; Velazquez: The Waterseller of Seville and the Rokeby Venus; Rossetti: Helen of Troy and the Beloved; Vermeer: The Pearl Earring; Wright of Derby: Experiment with a Bird in the Airpump; Gauguin: Tahitian Woman and Delacroix: Self Portrait. The final image, Olivia’s Look is a Contemporary Portrait. Portrait Paint in Oil is an essential guide for portraitists. Available in hardback in 2 sizes. The large edition measures 10x8in and is 96 pages long. The pocket sized edition is 8.5x5.5in and 150 pages, both bursting with colour images. Kindle edition is also available. 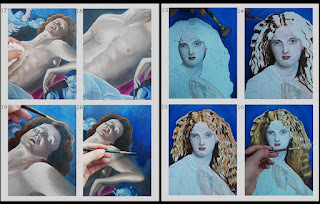 I have since written Skin Tones in Oil: 10 Step by Step Guides from Old Masters which sets out demos on how to paint masterpieces from the great artists Da Vinci, Michelangelo, Caravaggio Rubens, Courbet, Gauguin Botticelli Ingres, Cezanne and Titian. Briefly, I have BA Hons. Degree in Fine Art from Kingston University and have a PCET teaching qualification from Warwick. My guide book on portraiture Why do My Skin Tones Look Lifeless? This is good info of OIL PAINTING MEDIC. Keeping for sharing.